As I discussed in my last blog, we needed to replace some of the frames that weren’t being used by the bees. These frames were older, looked unhealthy and different. 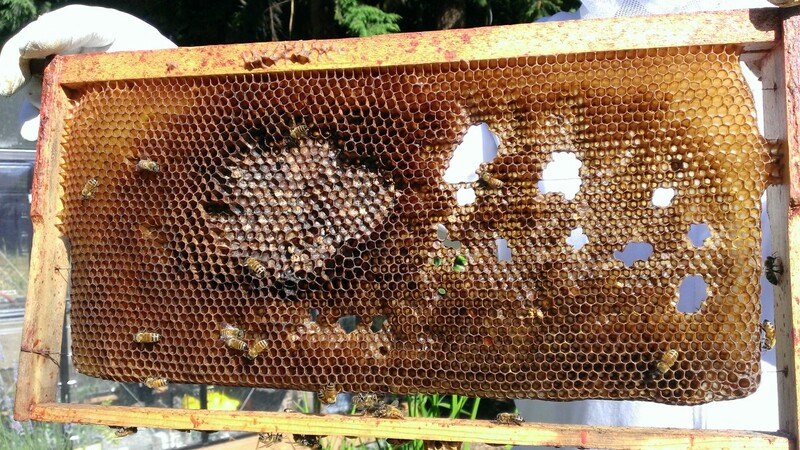 This may or may not be a problem as we don’t know what bees like or need, but the bees weren’t using them, which told us there was something wrong with the frames. 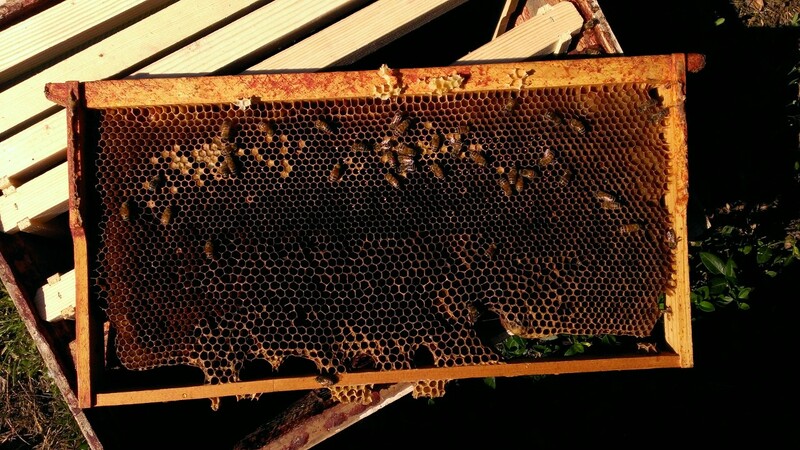 These frames were a part of the complete hive that we originally purchased, so the non-use by the bees wasn’t because they were new and unfamiliar. Here are pictures of a couple of these frames. There was a little activity on the frames, but they were largely not being used when other frames in the hive are overflowing with activity. The healthy frames were covered with bees and looked like the ones here, full or near full of either brood or honey. 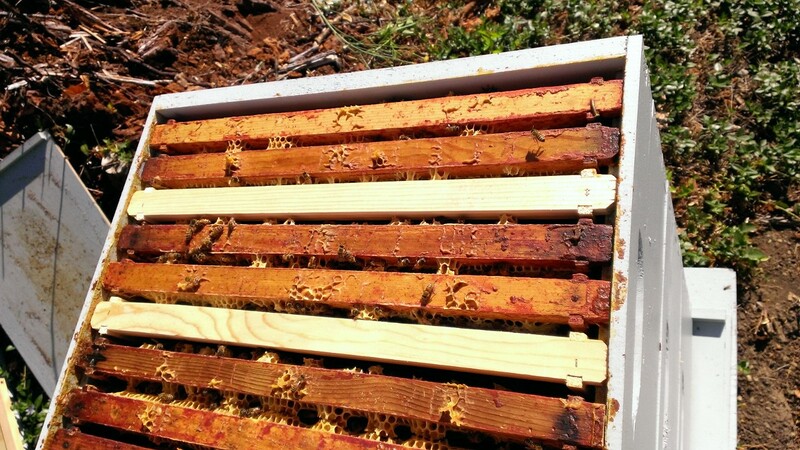 We replaced all the frames that needed replacing, making sure to alternate the new frames with the older frames in the hive. We also moved the frames filled with honey to the positions towards the outside of the boxes and the frames with available space towards the middle. A tactic our mentor told us about. We put two of the shorter honey super frames in the larger western size box so that we can leverage the technique that Jim Tunnell, the owner of the Beez Neez, taught at the last bee club meeting about checking for mites. These shorter frames will provide a space that the bees will use to build cells for the drone larvae which we can then use to check for mites. The picture below shows the two new frames interjected with the older frames in the brood box. While doing this inspection, we took extra effort to look for eggs as that was the part of the inspection we missed last time. The eggs proved to be incredibly difficult for us to see. We had a hard time finding them and was only really able to locate a few. We felt good about finding a few, thinking that we must have missed the others. We’ll keep an eye out for eggs in our future inspections. We feel that it has to get easier. Lastly, we set the removed frames around the bee hive so that the bees could reclaim anything that they want out of the frames. We’ve been told that they will reclaim honey. We weren’t sure, but thought maybe the bee pupa in the brood cells might also complete their metamorphosis and survive. 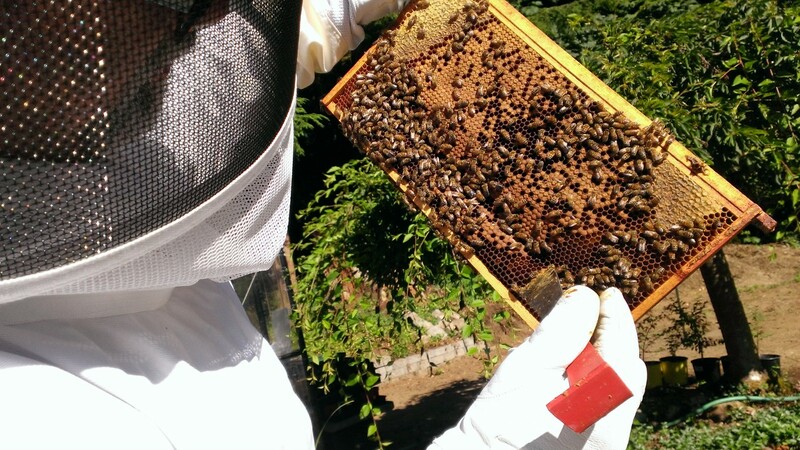 It was amazing to watch as the bees set about reclaiming things from these cells. They did a perfect reclamation of the honey, leaving only the beeswax behind. 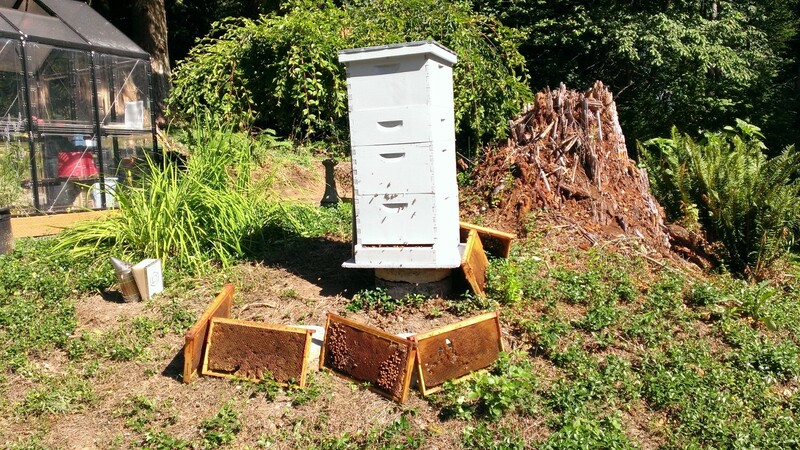 Gallery | This entry was posted in Bees and tagged Beekeepers, Beekeeping, Bees, Frame Replacement. Bookmark the permalink.